A polyether potassium ionophore. 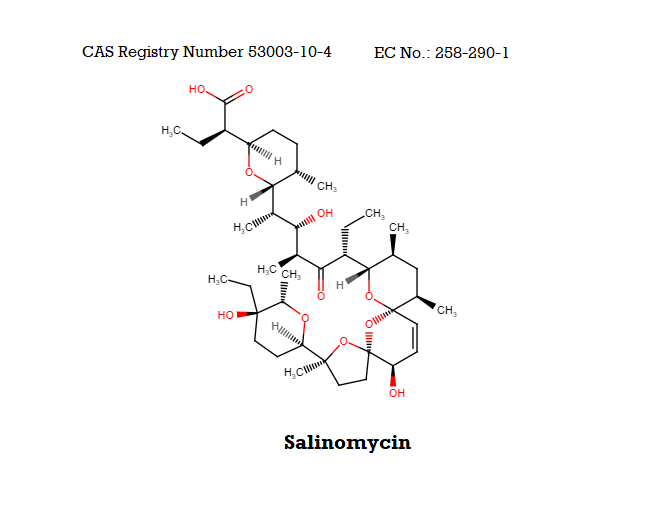 Salinomycin is potent antimicrobial, it acts against Gram-positive bacteria, among which there are some hard to treat strains, for example methicillin-resistant Staphylococcus aureus and methicillin-resistant Staphylococcus epidermidis, and Mycobacterium tuberculosis. As an anticancer candidate drug, Salinomycin has been shown by Piyush Gupta et al. of the Massachusetts Institute of Technology and the Broad Institute to kill breast cancer stem cells in mice at least 100 times more effectively than the anti-cancer drug paclitaxel. The study screened 16,000 different chemical compounds and found that only a small subset, including salinomycin and etoposide, targeted cancer stem cells responsible for metastasis and relapse. Gupta, P.B., Onder, T.T., Jiang, G.
Identification of selective inhibitors of cancer stem cells by high-throughput screening. On REACH List of Pre-Registered Substances, March 2009 Registration Date: 31-MAY-2013.